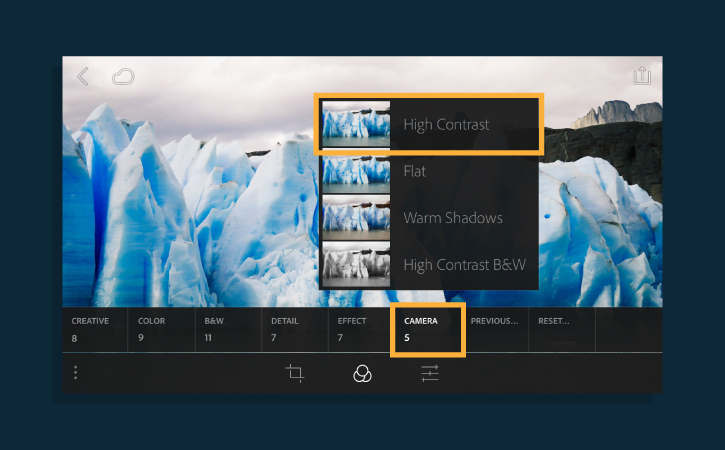 See how Andrew Ling, a Business Administration major at the University of Washington, uses Lightroom to create a stunning panorama using images from his mobile phone. Note: Sync to Lightroom CC on the desktop and the web requires a trial version of Lightroom CC or a Creative Cloud Photography plan subscription. Learn more about Creative Cloud plans. Open Lightroom on your device and click the + to create a new collection. Give your collection a name like Travel Photos. Open the new collection and choose Add Photos > Camera Roll. 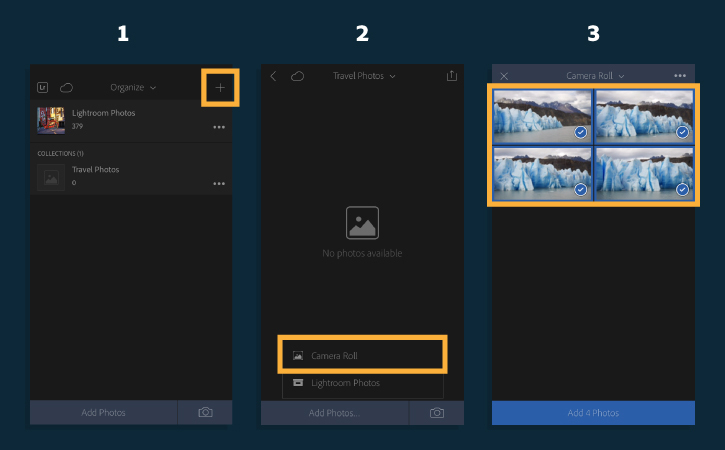 Select multiple photos from your camera roll to use in the panorama and add them to your new collection. You want all the travel photos in the panorama to have the same look. A quick way to do this is to apply the same preset to all the shots. Tap one of the images from your collection. Tap the Presets icon at the bottom of the screen, and choose Camera. Select the High Contrast preset to make the color and detail of the photo stand out. Repeat this process for all the other images in your travel photo collection. Lightroom on mobile is automatically synced with Lightroom on your desktop, so any collection created on your device will appear on your desktop. 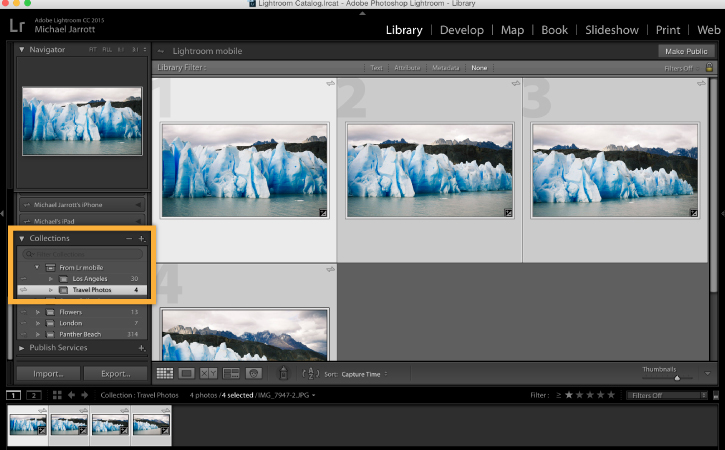 Open Lightroom on your desktop and scroll to the Collections section in the left panel. Open the Travel Photos collection under Lr Mobile. In the Library module, select all the photos to be used in the panorama using Command + Click (Mac) or Control + Click (Windows). Optional: If you want to re-create the panorama in this tutorial, download the demo files from CC Assets and import them into Lightroom. To create a panorama, choose Photo > Photo Merge > Panorama. 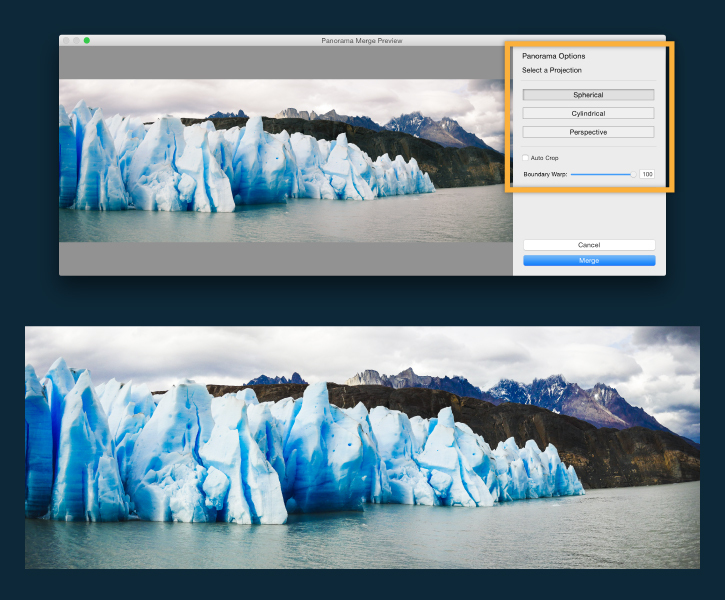 The Panorama Merge Preview window lets you see how your completed panorama will appear. Experiment with different options to get the look you're after. Andrew used the Boundary Warp option to stretch the edges of the image so that it neatly fills the frame, retaining the entire image. Click Merge when you're done.